Morning Friends! I must admit I do love a rained out Saturday the type where you are stuck inside watching movies, cleaning out closets and baking a mixture of goodies. Then Monday comes and you are kind of dragging because you need the sun to motivate you to start the new week. Today I sit looking out my office window at another rainy day and all I can do is daydream of the picture below! Come on Mother Nature, I had my rainy day break would you mind bringing back the SUN?! Days like this I jump over to Pinterest and start adding pictures to this board...the idea of a new phase motivates me to start working instantly! 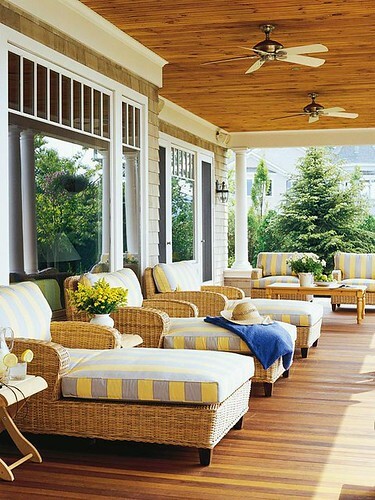 If I had this covered porch with those comfy chaises - I would be out there with a book - even in the rain! Yeah!!! I should post the rest of the house- kitchen designed by our pal @susanserrackd!